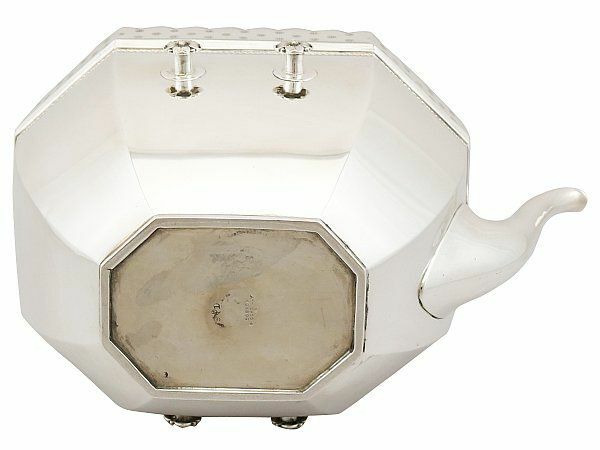 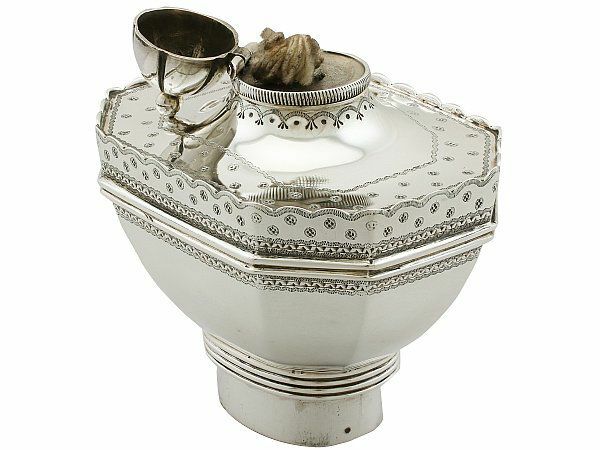 This exceptional antique sterling silver spirit kettle has an elongated octagonal panelled, rounded form. The surface of this Victorian spirit kettle is embellished with bright cut engraved circular motifs amidst undulating borders in addition to a broad band of applied ribbed ornamentation. Either side of the kettle is ornamented with two chased floral decorated pegs, allowing the kettle to sit securely on the stand. The protruding scalloped shoulders are ornamented with further bright cut engraved decoration. 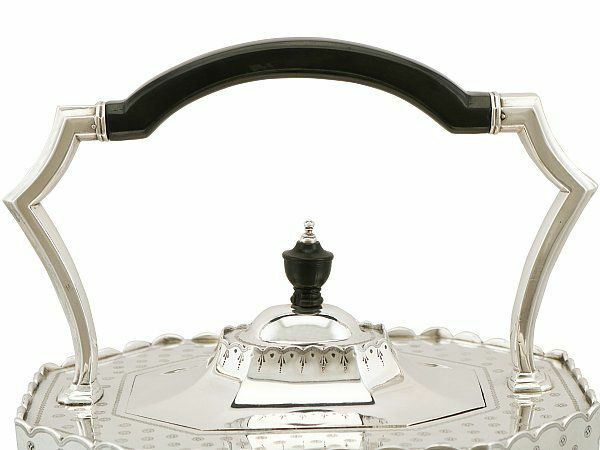 This antique kettle is fitted with a plain panelled, domed, flush hinged hallmarked cover which is encompassed with a bright cut engraved scalloped border with a stylised bud design to each incurve. 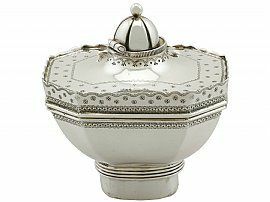 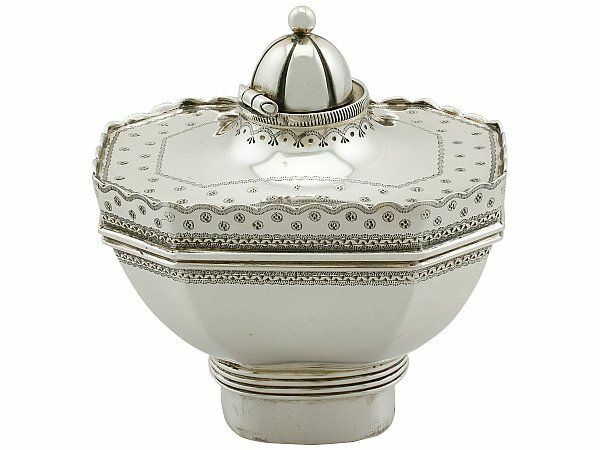 The cover retains the original urn style painted wood and sterling silver finial. 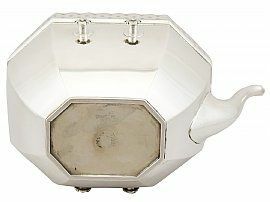 This fine example of antique teaware is fitted with an impressive incurved handle featuring the original carved painted wood handpiece and stepped sterling silver sockets. 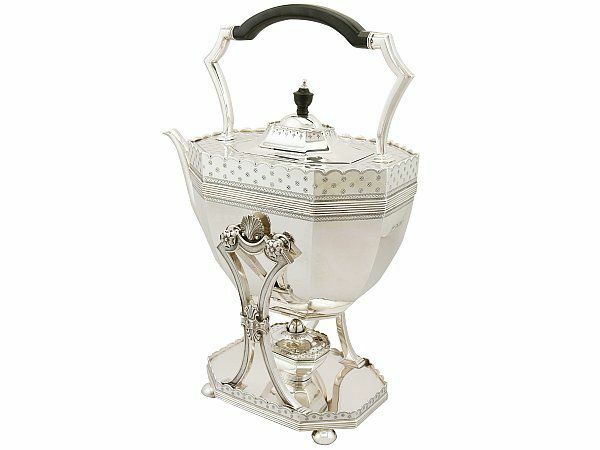 This impressive antique kettle is fitted with a plain swan necked spout. 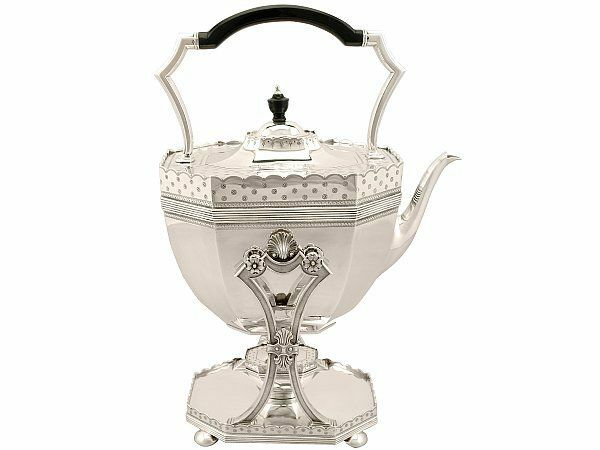 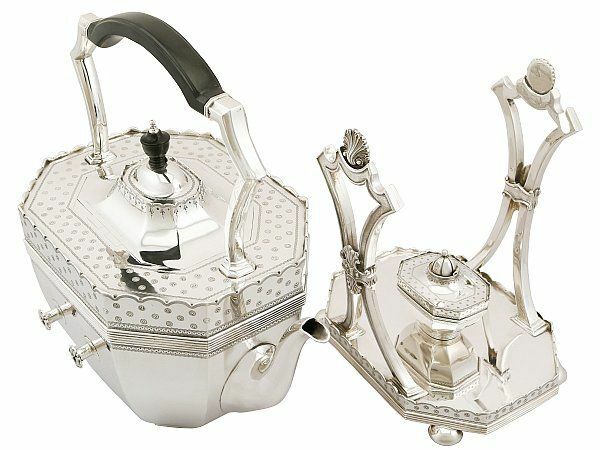 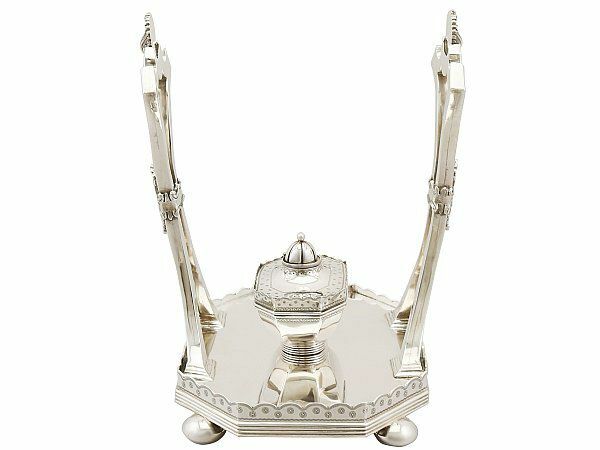 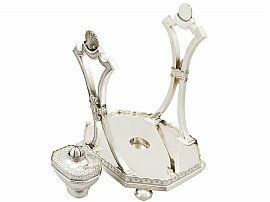 The kettle detaches from the original octagonal shaped hallmarked sterling silver stand, supported by four bun style feet. 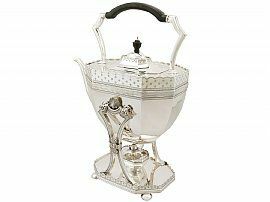 The stand is encircled with an impressive border reflecting that of the shoulders to the kettle. 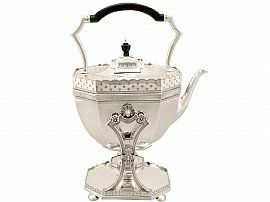 The fine and impressive waisted supports of the stand are embellished with impressive collared strapwork style ornamentation in addition to a shell motif to the centre of three incurved portions; these sections accommodate the pegs once the kettle is in situ. 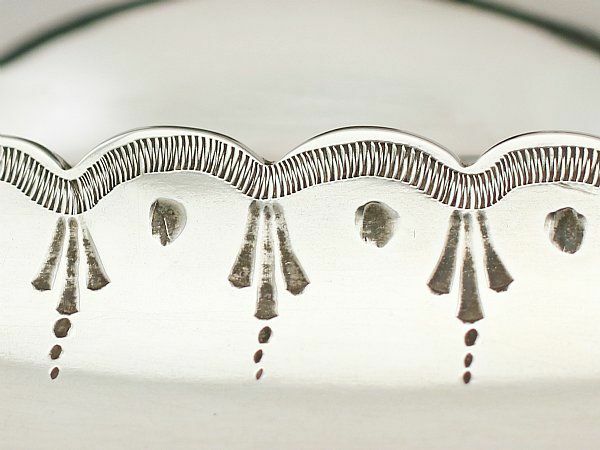 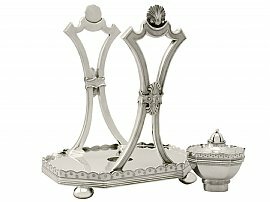 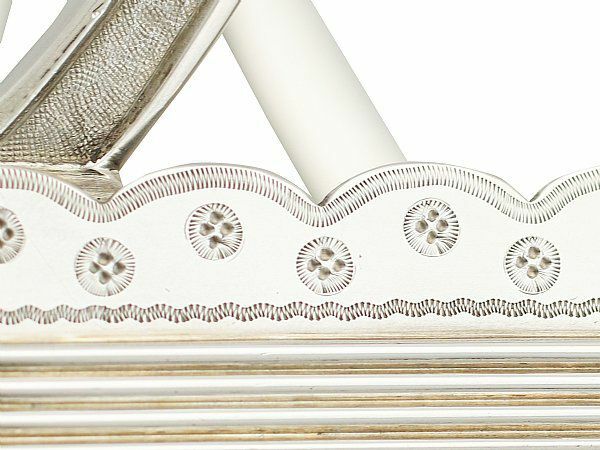 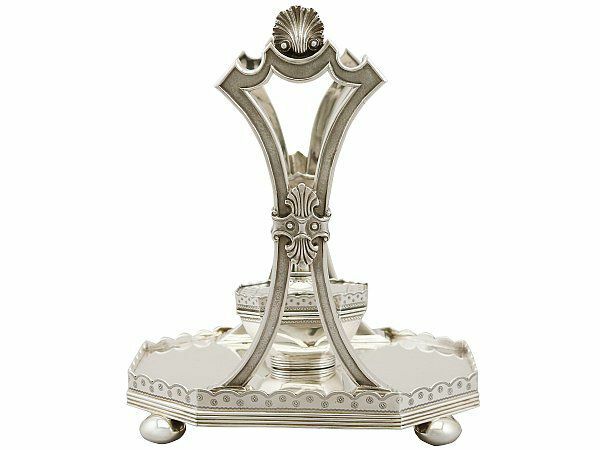 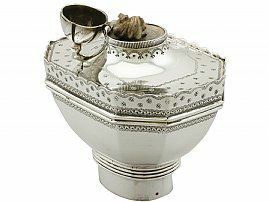 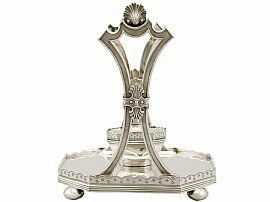 The plain base of the stand features an inset circular well fitted with the original, fine and impressive hallmarked detachable, push fit spirit burner. 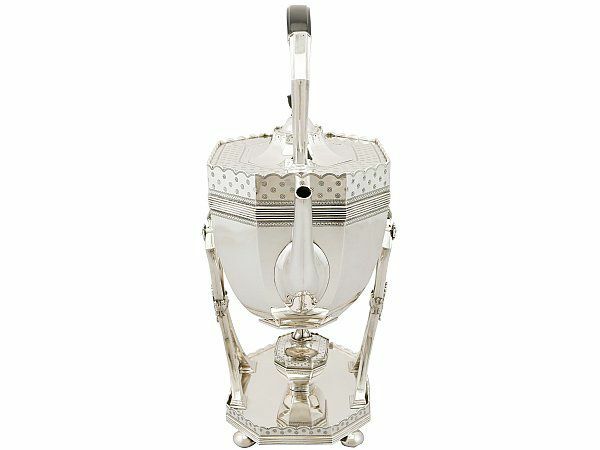 The spirit burner is fitted with a hinged panelled cover surmounted by a plain ball style sterling silver finial. 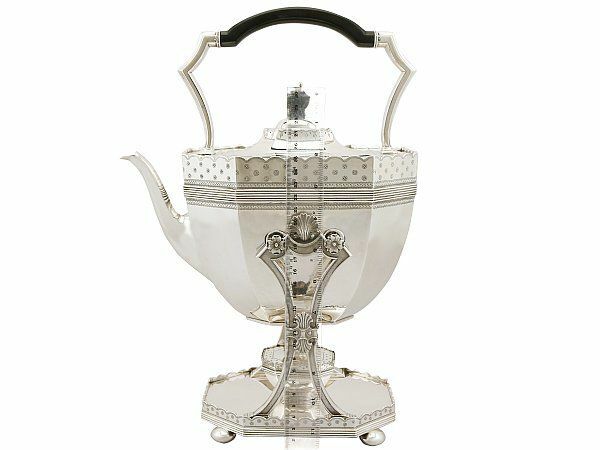 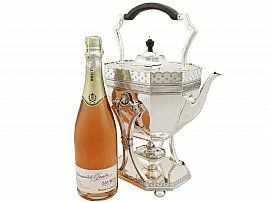 The applied and bright cut engraved decoration to the spirit burner is identical to that of the kettle body. 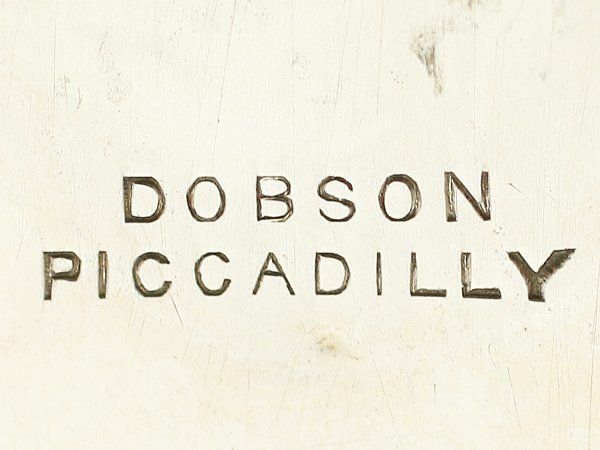 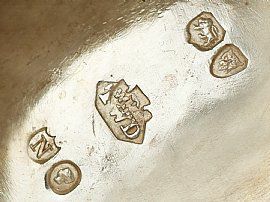 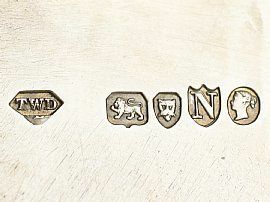 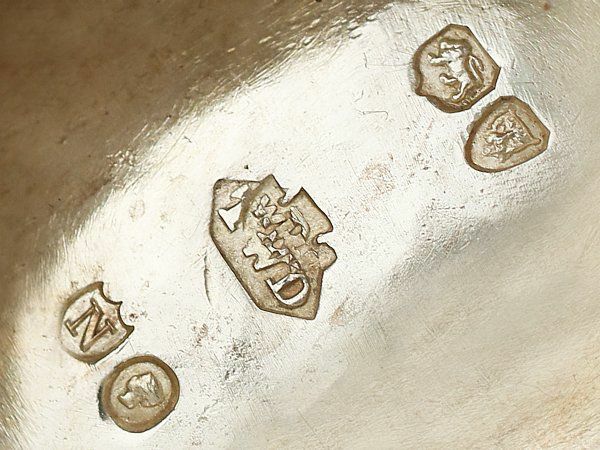 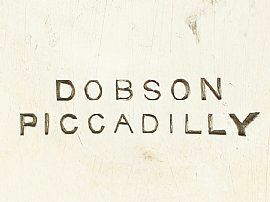 The underside of the kettle bears the retailer's mark 'Dobson, Piccadilly'. This Victorian spirit kettle is an exceptional gauge of silver, exceptional quality and in exceptional presentation condition. 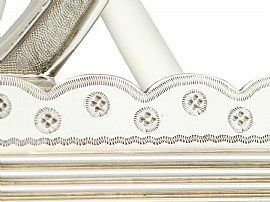 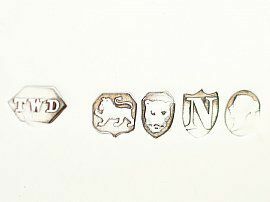 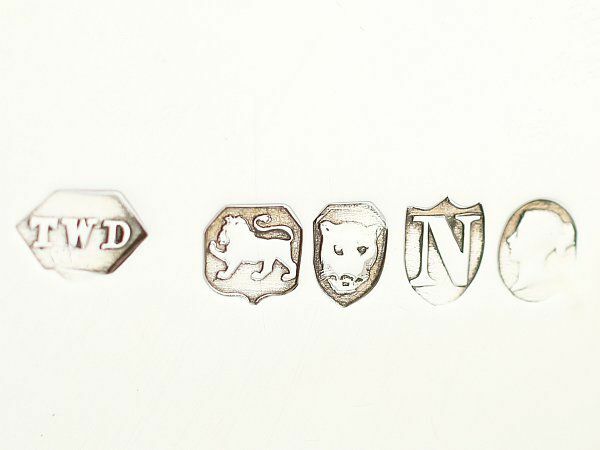 The applied and chased decoration is very sharp and the bright cut engraved decoration is very crisp. 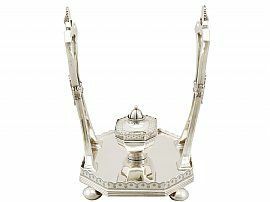 Full hallmarks struck to the surface of the kettle, stand and underside of the spirit burner are all very clear. 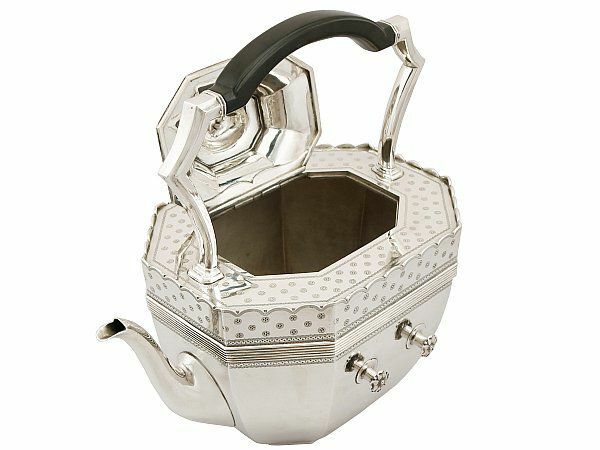 Length from back of spout to handle 26.1cm/10.3"
Height to top of handle 38cm/15"